This manuscript was prepared in 1828-30 for Maharani Jindan Kaur (c.1817-63), a younger wife of Maharaja Ranjit Singh (1780-1839) and mother of Duleep Singh (reg.1843-49). Since the 'Adi Granth' is so large, it was usual to make manuscript selections for private devotion. 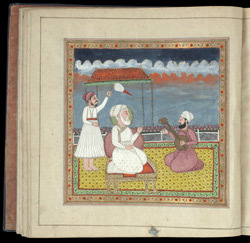 This personal prayer book of the Maharani contains three hymns written in the 'Gurmukhi' script, one by Guru Nanak and two by Guru Arjun (1563-1606).